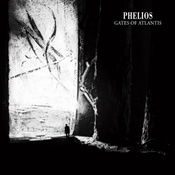 Bold, cinematic dark ambient is in store for you on Gates of Atlantis, the new release from Phelios. Although it’s something of a by-the-book dark outing, being grim, weighty, and a little on the bombastic side in spots, Phelios (aka Martin Stürtzer) refines it with his storyteller’s eye to fill it with a narrative sensibility. His vistas are large-scale and compelling, even if we’ve seen their like before. Take a track like “Hibernation” or “The Shadow Out of Time,” where ominous martial drums pound out a dramatic cadence and dark-wind drones brush coldly past as our mind moves in a smooth tracking shot through Stürtzer’s aural imagery. (Pär Boström’s cover art beautifully captures the tone, along with the album’s sense of scale.) Or find your way into sparse spaces described in long, miasma-draped drones that barely move. (“New Stellar Age.”) You know these zones if you’re a dark ambient listener; they are familiar ground. Thus, it takes a strong guiding hand to not simply settle into cookie-cutter genre memes. Stürtzer does that with authority and, in doing so, gives us a story worth listening to. Hail, Atlantis!